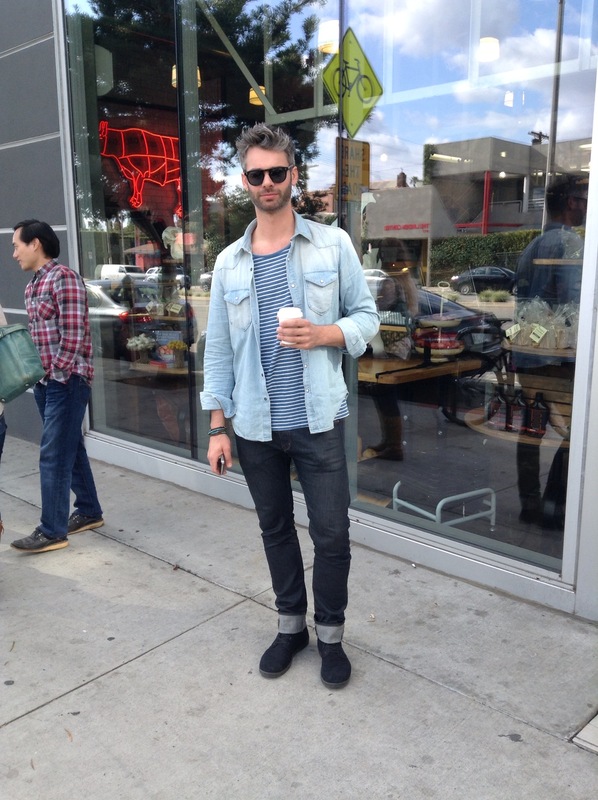 It’s no secret that Angelenos love their coffee and their denim, so it’s not a surprise I always spot a great Canadian Tux when I hit the Coffee Commissary on Fairfax. Of the four I saw there today, photographer Dan Collopy was definitely rocking the best one. Pictured above, outside of Lindy & Grundy, Dan is in a denim shirt and waxed jeans, both by H&M. This entry was posted on Sunday, January 27th, 2013 at 3:23 pm	and tagged with Canadian Tuxedo, Coffee Commissary, Dan Collopy, Denim, Denim on Denim, double denim, Fairfax, Fashion, H&M, Lindy & Grundy, Los Angeles, photographer, photography and posted in In The Wild. You can follow any responses to this entry through the RSS 2.0 feed.